The folks at Sunburn Festival have just announced the Phase 2 headliners for the the flagship event, Sunburn Goa 2015 which will take place in Vagator from December 27th to December 30th. 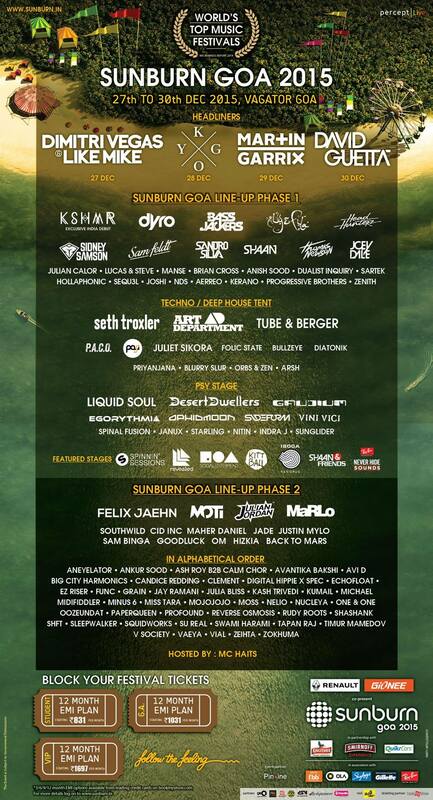 A few weeks back, Sunburn Goa 2015 Phase 1 Artist lineup was revealed which featured David Guetta, Martin Garrix & KSHMR. As far as the Phase 2 Headliners are concerned: KYGO and Dmitri Vegas & Like Mike will be headlining Sunburn Goa 2015. There have been two palatial additions to the festival in the form of the introduction of a Spinnin’ Sessions Stage and a Revealed Recordings Stage.The Revealed Recordings Stage is set to be headlined by Dutch prodigy and Hardwell’s very own Dyro, who will be accompanied by other Revealed Recordings apprentices like Julian Calor, Thomas Newson, Joey Dale and Manse. Previous article Bacardi EVC set to kick off Launch Tour in Goa!